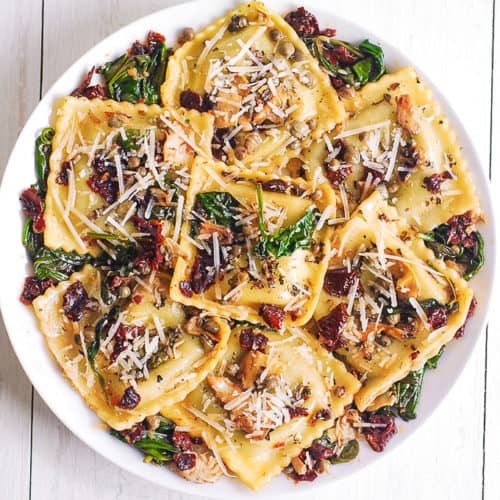 Italian Ravioli with Spinach, Artichokes, Capers, Sun-Dried Tomatoes. The vegetables are sautéed in olive oil. Meatless, refreshing, Mediterranean style pasta recipe that doesn’t need any meat – this meal will keep you full! For this recipe, I used store-bought ravioli stuffed with pesto. You can use ravioli stuffed with anything! You can also use cheese stuffed ravioli, veggie stuffed ravioli, or pretty much any kind of ravioli you see in the store. You can make your own ravioli if you like too. 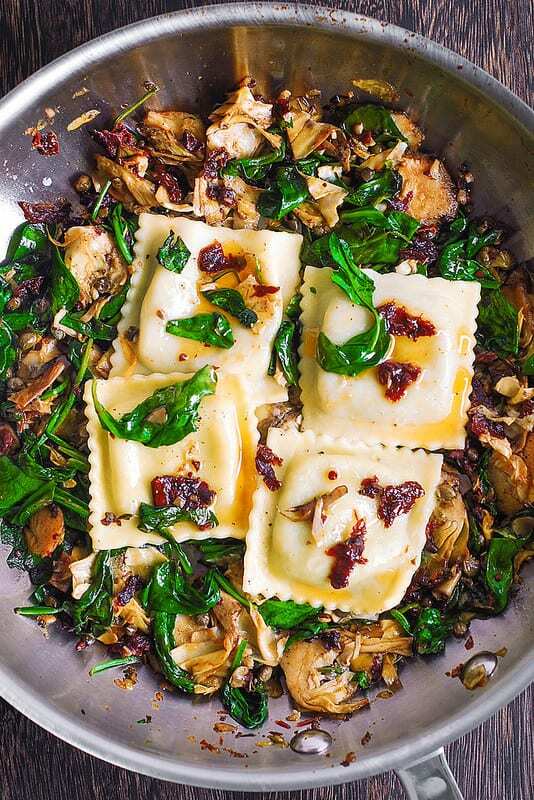 Back in the day I used to make my own homemade Italian style ravioli from scratch, such as these spinach and goat cheese ravioli or these delicious spinach and ricotta cheese ravioli. To make ravioli taste delicious and not boring or bland, you have to make sure the ravioli is accompanied by something that enhances its flavor, such as a delicious sauce or a bed of vegetables. In this case, I sautéed chopped sun-dried tomatoes, chopped artichokes, capers and spinach in olive oil and garlic and then added cooked ravioli into all of this deliciousness. The recipe takes only 30 minutes from start to finish. Easy and fast is always good! You can use any type of ravioli you like. Stuffed with anything. Store-bought or homemade. Any ravioli will work in this recipe. 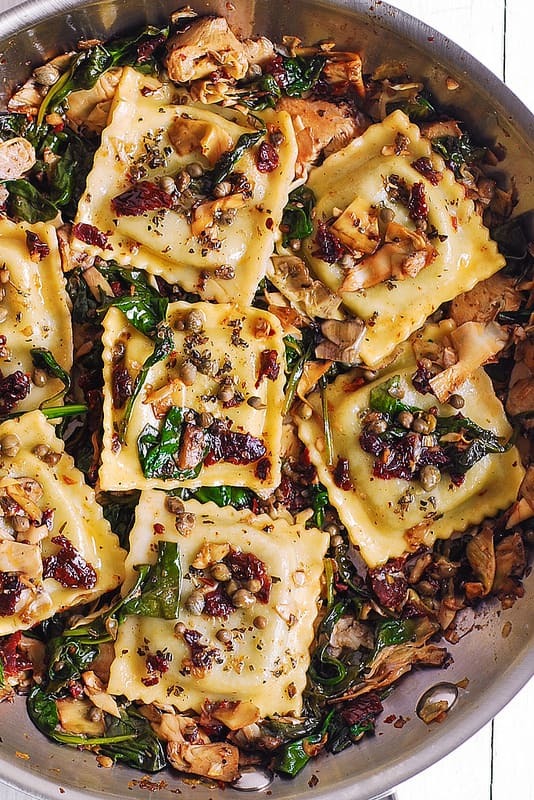 These Italian ravioli taste so good and look amazing on a plate. Great presentation (that’s easy to make) never hurts! 1) Cook store-purchased ravioli until al dente. Drain. 2) Heat 2 tablespoons olive oil on medium heat in a large skillet. Add chopped sun-dried tomatoes, chopped artichokes, capers, Italian seasoning and cook for 2 minutes. Add fresh spinach, and continue cooking and stirring until the spinach wilts. 3) To the skillet with sautéed vegetables, on medium-low heat, add cooked ravioli, 1 tablespoon of olive oil, and stir. The dish should be salty enough from capers. Sprinkle with shredded Parmesan cheese when serving. 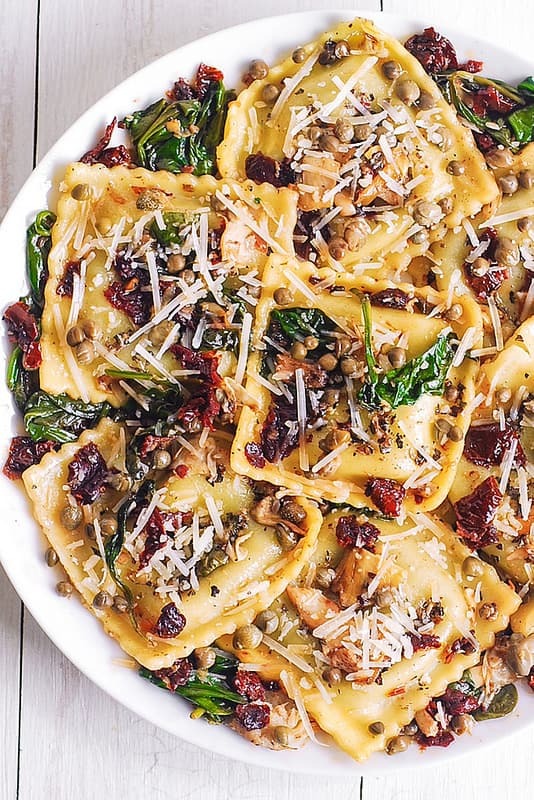 I love spinach and artichokes, and I knew they would make a great combination with ravioli. 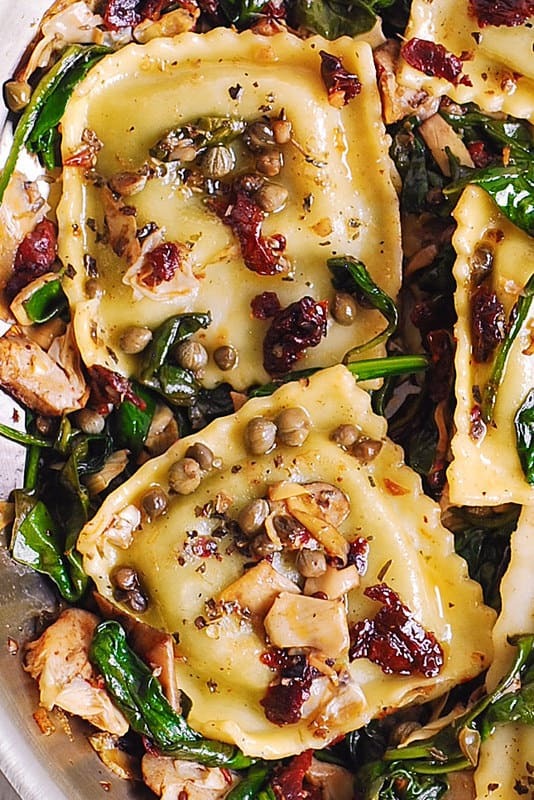 And, capers and sun-dried tomatoes always make pasta recipes even more delicious. It’s such an easy recipe, especially if you buy high quality, pre-made ravioli in the store – and there are plenty of choices these days. Just dress them up with these sautéed vegetables, and you have a delicious dinner that everybody will enjoy. This Italian ravioli recipe tastes like something from the Mediterranean restaurant: pasta, veggies, olive oil, and garlic. What’s not to like? While store-bought ravioli work great in this recipe, you can always make your own ravioli and use your own homemade ravioli with this recipe as well. I’ve made 3 different types of ravioli completely from scratch in my own kitchen in the past and published the recipes with detailed instructions on this blog. I used ravioli mold to make my own homemade ravioli but you can use your own favorite ravioli-making tool. See the recipes below. 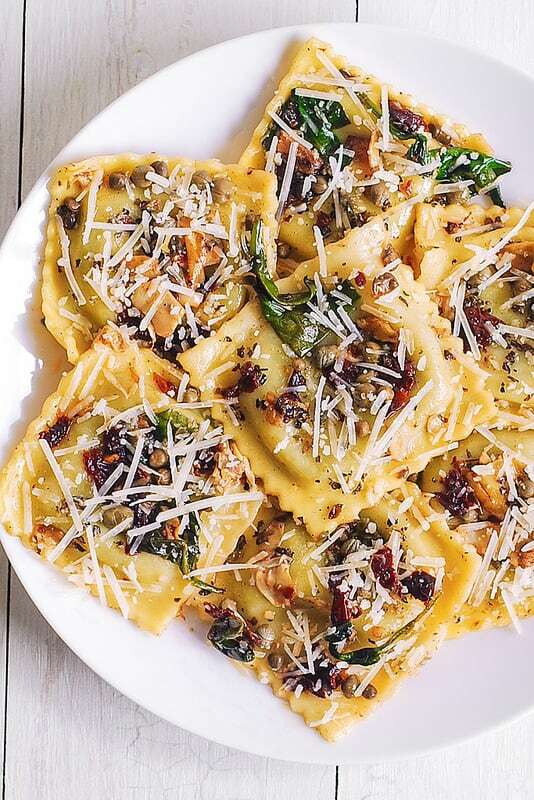 Italian Ravioli with Spinach, Artichokes, Capers, Sun-Dried Tomatoes. The vegetables are sautéed in garlic and olive oil. Meatless, refreshing, Mediterranean style pasta recipe that doesn't need any meat - this meal will keep you full! Cook ravioli until al dente. Drain. In a large skillet, heat 2 tablespoons olive oil on medium heat. Add chopped sun-dried tomatoes, chopped artichokes, capers, Italian seasoning and cook for 2 minutes. Add fresh spinach, and continue cooking and stirring until the spinach wilts. To the skillet with sautéed vegetables, on medium-low heat, add cooked ravioli, 1 tablespoon of olive oil, and stir. The dish should be salty enough from capers. If it's not, add more salt (or capers), if needed. When serving, top with shredded Parmesan cheese. Made it today for the first time. Yummy! My whole family loved it. So happy to hear that! Thank you for your comment! I have made this several times and love it. My boyfriend gives the yummy sign every time. 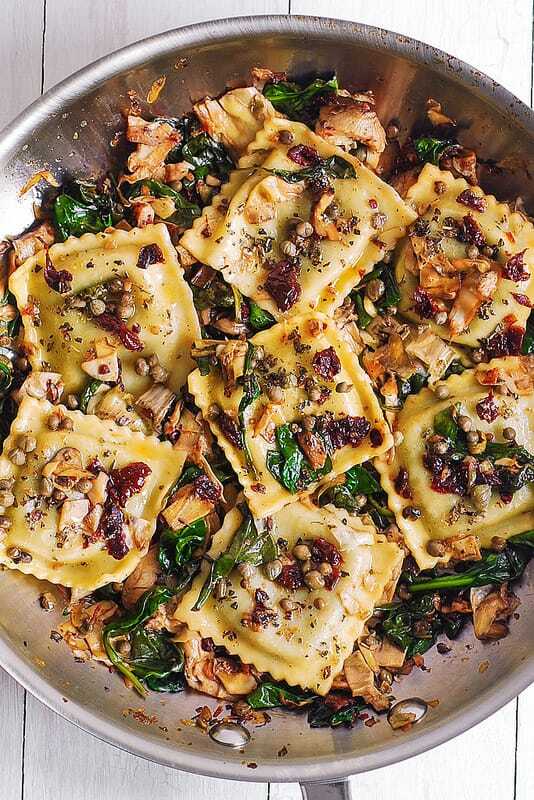 So easy and I use frozen spinach and cheese ravioli so I always have the ingredients on hand for a quick delicious meal. Served with a crisp salad and hot rolls you cannot beat this. Thank you. I am so happy you’ve been making this recipe several times. 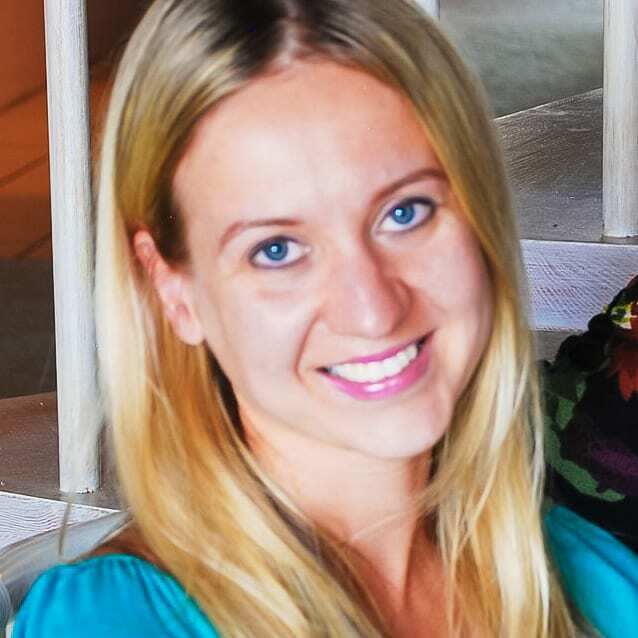 Very happy to read comments like yours! Serving this with the salad and the bread is the best! Very good and fresh! I added garlic a splash of chicken stock and white wine. Delish! So happy to hear that! The addition of a splash of chicken stock and white wine sounds delicious! Do you use the sun dried tomatoes in oil, or the dried? I used sun-dried tomatoes in olive oil. Best recipe EVER! I made it for the first time this week and was so torn between sharing with my next door neighbor (who I swap recipes with constantly) or pretending I never made it and eating every single solitary bite myself with all the curtains pulled shut! I opted to share. I know. I know. I did the right thing. Only means I’ll make it again sooner! Janet, your comment makes me smile! So glad you enjoyed the recipe together with your neighbor! Thank you for such a wonderful comment! Made this tonight. It was so easy and so delicious! Husband remarked it was like a fine restaurant meal (we frequent Cooper’s Hawk). Purchased smoked sundried tomatoes by mistake and was still wonderful. Thank you for sharing your recipe! You are very welcome! I am very happy you liked this recipe! Thank you for such a kind comment! It was fine. I thought it was lacking something though. Maybe a sauce? Maybe garlic? I’m not sure. I am glad you enjoyed it! You can definitely add garlic for more flavor! I made this recipe for my family’s Christmas gift exchange. It was easy to make and delicious. I substituted pine nuts for the capers. It was a hit and I’ll definitely make it again. Stefani, I am so glad you liked this recipe. Using pine nuts sounds delicious! I’ve made this recipe a few times and it’s delicious! I like that it’s not just dumping some red sauce on. This is a great option. The artichokes, sun-dried tomatoes and capers really add a nice touch. It’s definitely a grown-up dish. Oh…..lovely….thanks! Tonight I added a bit of garlic and some pine nuts….yum! Garlic and pine nuts sound delicious with ravioli!